The Colossus Hookah from Mya Saray is aptly named as this colossal hookah towers above all other Mya hookahs at 40 inches in height. Featuring the most intricate cloisonne metal work of any hookah we've ever seen, the Mya Colossus is a true beauty. 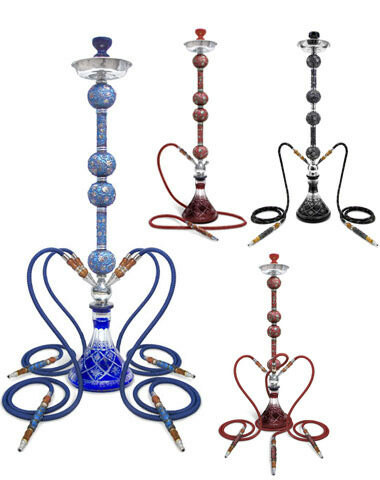 This massive hookah comes in blue, red, or black and is available in configurations with up to 4 hoses, all of which come with a handy hard shell hookah case which makes transporting and storing your hookah a breeze. Inside of the case you will find matching cloisonne hoses, a porcelain bowl, tongs, tray, and all of the gaskets necessary to get this champion of a hookah sealed up tight. From the moment you open the case, you will realize that the Mya Colossus hookah is something special. All Mya hookahs can be converted to multi hose with the addition of an autoseal Mya Hose Adapter and some extra hoses. 40" Mya Colossus Hookah has a average rating of 0 stars out of 5 stars based on 0 reviews.